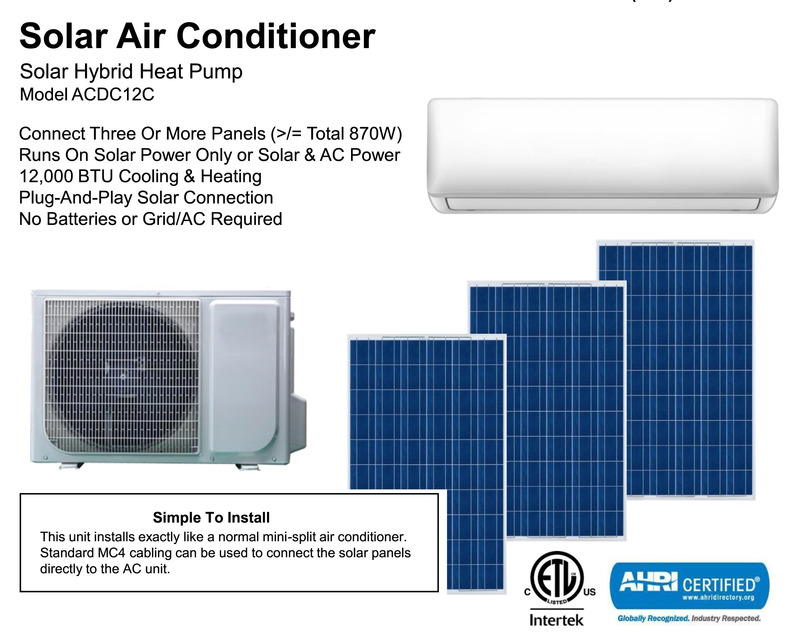 Solar Air Conditioner – Pre-Order New Model! PRE-ORDER TODAY FOR $250 LED GIFT CARD! Each Unit works with 3 to 6, 72-cell solar panels. Your air conditioner needs the most power when the sun is shining, a coincidence you can take advantage of with our ACDC12B solar air conditioner. It can keep an indoor area cool during the day for free, or for just pennies at times when solar power is not sufficient to carry 100% of the load. Use this system to cool a small area or to augment a larger system. Connect three (up to six) solar panels (290w-360w per panel) in series. The unit can also connect to 220v (208-240v) AC power for extra power during overcast conditions, transient clouds, or at night. No need for batteries. Even when the sun is not shining at all, this ultra high-efficiency (SEER 22 without solar) heat pump will keep you comfortable and save you money using far less electricity than a normal AC or heat pump unit of the same capacity. Calculated using only paid-for energy, the ACDC12C produces an equivalent SEER above SEER 75. THIS BRAND NEW SOLAR A/C WILL BE DEBUTED AT SPI (SOLAR POWER INTERNATIONAL) IN ANAHEIM, CA AND WILL BEGIN SHIPPING IN SEPTEMBER 2018. PRE-ORDER YOUR UNIT NOW AND RECEIVE A $250 LED LIGHTING GIFT CARD TODAY!